Football powerhouse of Northeast, Mizoram has named the final 20 member squad for 2018 Santosh Trophy with several key players missing. 2014 edition of Santosh Trophy champion Mizoram will participate without its captain R Malsawmtluanga who scored two vital goals at the Northeast Zone qualifying round which secured them the top position in the region. R Malsawmtluanga was the best player in the recently concluded Mizoram Premier League (MPL) helping his team Chhinga Veng FC to win the coveted MPL and Independence Day Trophy. R Malsawmtluanga has joined the Mizoram Police and is undergoing training. Other key players who were pivotal in the qualifying rounds of MPL season 6 best goalkeeper F Lalmuanawma, Vanlalbiaa Chhangte, Lalrawngbawla, Lalrinchhanna and Lalrammuanpuia were not included in the squad. Vanlalbiaa Chhangte has joined Minerva Punjab and other players have joined the Mizoram Police and are undergoing police training. Three time MPL champion coach Lalsangzuala Hmar said his team has recalled several experienced players who won the Santosh Trophy in 2014 and that his team is complete and all the 20 members were key players. “The team is the best we have in Mizoram,” Lalsangzuala Hmar said. Unlike other states Mizoram Football Association has been relying on its home grown and local league players for Santosh rather than depending on the busy players of I League and ISL. “Yes, we have many players playing in I League and Indian Super League, but we prefer local lads, it not only gives them a chance for exposure but also avoid the hassle in last waiting game of the top footballers who played in the big leagues,” Hmingthansanga, Manager of Santosh Trophy team and Executive Member of Mizoram FA said. 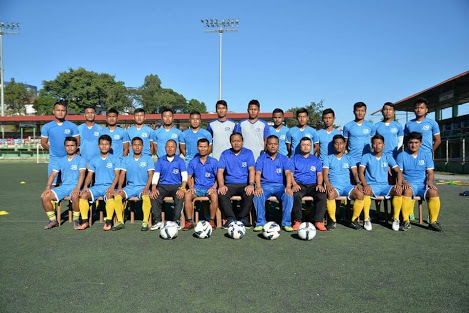 Several players who helped in Mizoram’s Santosh Trophy final qualifications are absent, but Mizoram doesn’t lack in talent, experiened players from Mizoram Police football team and MPL players will help enhance the Mizoram Santosh team. “Mizoram Premier League top scorer MS Dawngliana has been recalled and several experienced players from Mizoram Police team will join us,” Lalsangzuala Hmar, Mizoram Santosh team coach said. Mizoram has been drawn in Group B along with Goa, Karnataka, Odisha and Punjab. Mizoram won this coveted national trophy in 2014, made it to the semi finals of 2015 and 2017. This year’s Santosh Trophy, is the 72nd edition which will be played in West Bengal between March 19 and April 1.